We left West Beach Camp Site and said goodbye to the sea for the time being, and headed for Culloden stopping off at Findhorn and Nairn on the way. 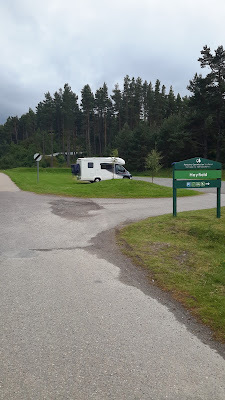 At this time we were on the lookout for good spots for overnight camping and we thought Findhorn may fit the bill, however when we arrived and parked in the huge car park behind the beach we found numerous signs saying this was not allowed. Findhorn is located on a little spit of land that boarders the coast line of the Moray Firth. We set off for a short walk over the sand dunes to Findhorn's wonderful beach - which to the west extends only as far as the mouth of Findhorn Bay, but to the east, it extends for seven miles. Findhorn is also home to the Findhorn Foundation - a community based on spiritual values, which was founded on a caravan site in 1962 and which has grown and developed since then. We didn't linger long at Findhorn, but continued on our way to Nairn where we found a nice parking spot close to the beach where we stopped for a while to have coffee, then after our break we set off for a walk and headed down to the harbour. Here we met the Harbour Master and took the opportunity to discuses overnight camping with him. He informed us that there is no law of trespass in Scotland as such, and that basically, as long as you are sensible and not causing any harm you can mostly park anywhere. He went on to tell us that that the previous night there had been 10 motor homes parked on the quay side, and he also pointed out another small parking area nearby that is regularly used. However, we were not ready to set up camp at that time, and as we had laundry to sort, we headed for The Caravan Club Culloden Moor site which proved to be a good choice because it was only a short walk to our next point of interest which was The Culloden Moor Battle field. The site is owned by the National Trust for Scotland, and it was here that we were persuaded to sign up as members again. We had paid £19.50 to get in, but they only wanted £41.25 (senior membership) for us to be full members for the whole year, so it seemed like a bargain, especially now we have plenty of time to visit their properties. At The Culloden Visitors Centre we were informed of the sequence of events that lead up to the battle that occurred on 16th April 1746, and the implications that it had in changing Scottish History. There were also interesting accounts from people who were involved in the battle, and also a brilliant 360 degree immersive film reliving the horror of the fight. We finished the experience with a walk around the actual battle field which was accompanied by an audio guide with GPS technology that explained what happened on that day. A Cottage built on the original Farm Site. I have always wanted to visit Culloden since reading Diane Gabaldon’s excellent time slip books. In them the heroine, Claire is transported back in time to 1746, where she meets and falls in love with Jamie Fraser. The books have now been made into the series ‘Outlander’ which I have yet to see, but I am definitely looking forward to viewing. Following our visit we wondered back to the ‘Tardis’, did our washing, and then settled down to be lulled to sleep by rain drumming on the roof. Today we moved on to Glenmore Forest Park in the Caingorms. I had read about a little business there that promotes wild camping in the Forest and provides for the needs of people doing this with showers, a sauna and loos. They even allow you to park on their land for free, and only ask that you buy something in their shop or bar. We didn't park on their land because the slope to get to it was a bit to steep for the T4rdis, but not much further down the road we found the Hayfield Car Park where for the sum of £2 we could park all day, and additionally, there were no restrictions on overnight parking. However, we did note that our ticket would expire at midnight and would need to be replaced for the next morning, so overall it cost us £4 - another bargain! Following setting up camp we walked down to Lock Morlich and had our picnic lunch on it's shore, and then continued our walk and circumnavigated the loch before returning to the van for a quick cuppa. We then set off again to Lochan Uanine (the Green Lochan) where we found the waterside to be very peaceful but we couldn't linger long because the midges were trying to feast on our flesh! We made our return journey using a different track - and after a short while the terrain became quite challenging. It was very steep, muddy in places and the path was strewn with tree roots and boulders. Xmas Trees on the way to the Green Lochan! 20th July Today we moved house before breakfast! whoops I mean we moved the van - about one and a half miles down the road, and parked in another £2 spot right on the edge of Loch Morlich, however we were not alone. The spot was idyllic and It seemed to be quite a favourite place for Motor homes to overnight - there were several others to keep us company. Following our move we cooked our breakfast and prepared for a long bike ride! We packed our panniers with lots of goodies and set off on a cycle track heading towards Coylumbridge and then, following Sustran's route 7 we continued towards Boat of Garten. It was from here that we made our first detour of the day - to the Osprey Centre on the bank of Loch Garten. It should have cost a tenner to go in but as we're members of the RSPB it was free - good job as there was no main event!! We retraced our tyre tracks back to the Boat of Garten and continued along Sustran's route 7 till we picked up the Spey Side Way, and this proved to be an excellent track that crossed over open country side, and then tipped us out just outside Aviemore. From here we cycled past the Cairngorm brewery which filled the air with the smell of hops and barley, and of course we had to sample their wares!! By this time we had spent a lot of energy and I was desperate to find a lunch stop (23 miles) - luckily we soon found a nice comfy bench at Inverdruie - just opposite the Rothiemurchus Visitor Centre and Farm Shop. However, we didn't venture in at that time but hopefully we will return as we leave this area in a couple of days. From here we continued on our way towards Feshiebridge but were sidetracked again to visit Loch Eilein. This is on Rothiemurchus land, and for the honour of visiting cars have to pay £1.50 per passenger, but as we were on our bikes we entered for free. We had another coffee stop here but unfortunately the peaceful tranquillity was disturbed by the roaring of RAF jets circling as if they were playing tag!! Anyway, forwards and onwards but we didn't get much further before we found another point of interest in the form of Frank Bruce's Sculpture Trail. He died in 2009 but left behind some very weird but interesting pieces of work which are now displayed in a little park area. By now it was about 4.30pm and we still had quite a long way to go. Also the skies were starting to look quite ominous so we decided to head back to the Tardis as quickly as possible, however we still continued to be sidetracked and felt the need to stop at a little shop in Kincraig to buy strawberries - it was a good decision because they were delicious . Our return from here was less peaceful (because we were on a busy road) but it was still quite beautiful, especially when we passed Loch Alvie. Luckily a lot of the way was downhill so we made quite good time until we got back to Inverdruie, where we picked up another cycle track which started undulating - but mostly upwards! However, it took us all the way back to a camping spot and we just made it before the rain came in earnest. In all we cycled 45 miles so we were soon ready to be tucked up snug in our beds. Today John decided we would cycle up the road to the ski centre at Cairngorm!! He said it was about 5 miles and there was only one black arrow on the map (which signifies a gradient of 14 - 20%) so I felt reasonably reassured that I would be able to manage it - I was nearly sick! Luckily the really steep bit was at the beginning of the hill, and as we got further up the gradient eased. As we were riding the first bit I did ask myself 'why are we doing this', but as we got further up the views opened out, and as we got to the top there was a great sense of achievement - so that answered my question. Also, being as John got to the top first he left his bike propped at the side of the road and came back down a short distance to cheer me on 'Tour de France' style - he made me laugh. At the top we got our trusty flask of coffee out and following a quick break we started our decent. It had taken about an hour to ride up but we were safely back down in about 10 minuets! I kept telling John 20 is plenty - but he was so far in front I don't think he could hear ! We went and collected the van and then drove back up the same hill to a parking spot we had noted on our first ascent. We thought we would have it to ourselves but as the evening drew in more vans arrived and in all there about 10 of us up here now but there is plenty of room. our spot before all the neighbours arrived. We are about 700 metres up but during the afternoon we climbed even high. We followed a footpath for about 2 miles up through the bolder fields below the Cairngorm Summit. On the photo below you can just about see the continuation of the trail as it heads for the peak but we felt it was probably beyond our ability for today as we had already had lots of exercise earlier. The path is on the left of the picture and the white blobs are snow in July! At this point we sat for a while to admire the view, and luckily, although the wind was howling around the sun was out so it was quite warm, then after a while we started to make our way down, and again, we completed this journey in a much shorter time than when we had made our ascent. We finally made our way back to the ski centre where we did a bit of shopping (I brought John a T-shirt). and we stood and admired the ski sculpture and the Funicular railway which we could have taken up!! Since our adventures of today we have been back in the van enjoying our lovely camping place and another Wildcat beer. Tomorrow we will move on again to Braemar but that will be another story.